We often receive interesting emails from our customers letting us know how they’re using our locks and lock picks. We received a very cool email this week from Gavin Hougham. Gavin took our Ultimate Practice Lock and one of our lock picks sets on his trip up Mt. Rainier, one of the highest mountains in the contiguous United States. Gavin told us that he took his practice lock in case he got bored with the scenery. This time, he says the scenery won out. 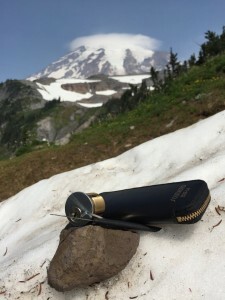 Lock picking is a lot of fun but I’ll agree – the scenery is pretty awesome. The photo below, posted here with Gavin’s permission, is taken from 6,400 ft. As I sit here typing in 85ºF August weather, Gavin gets to play in the snow on the other side of the country. Click the photo to enlarge.